Rex on if Tebow is frustrated with his role: "Any competitor wants to get on the field... it wouldn't be shocking if that's how he felt." Rex: "At times, Mark looked pretty good. when he had time to set feet, he was fairly accurate with the football.... I think Mark's our guy"
Rex on Tebow: "We'll take a hard look at how we're using him." ... and look if they can't use him better/more. Rex on looking at using Tebow more during bye week: "I think we'll take a hard look at how we're using (Tebow)." Tebow was ALL Woody. Period! Rex Ryan said he will listen to all ideas. "Is it a little change? Is it a radical change? I’m up for anything. We have to get better." Rex Ryan looking for input from all coaches: "Is it a little change? Is it a radical change? I'm up for any suggestion." Rex on the defense: "I think we're getting better." Rex on #Jets defense: "I think we're getting better. It's not where we want to be." Last edited by C Mart; 10-29-2012 at 10:25 AM. Exactly. But here's a bit of poetic justice for both Woody and Tebow: Neither saw that the Jet ineptitude (SOJ curse?) would, essentially, kill "Tebow-Mania". 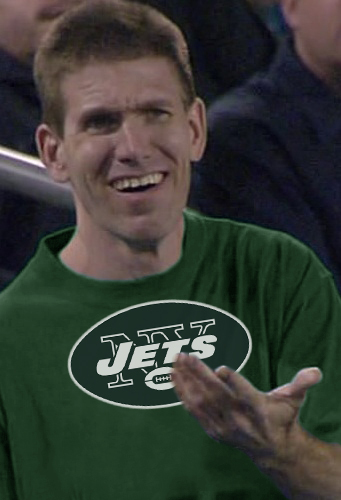 (Only the Jets, folks. Right?) Hiring an under-qualified dunce like Sparano to design/effect the offense has rendered Tebow as an ineffectual bit role player. The talk/buzz about Tebow is virtually non-existent, and I'm sure Tebow gear isn't moving off the shelves. Good. Let both Woody and Tebow suffer for their vanity and greed. Hey, Woody, you choked...again. Rex said by the time the team gets back from Seattle, Eric Smith, Bart Scott, Powell and Kenrick Ellis should be healthy. Rex said they will look at making changes among the starters. Rex Ryan said the #Jets will consider making changes among starting lineup. Sanchez, however, remains starting QB. I agree with this post except for the part about any of this being Tebow's FAULT ... The guy is just trying to play the game. I fault Tebow for taking the gig here because of the media exposure and ability to sell his "brand" in the NY Metro Area. He could have worked out a deal with a smaller market team, which would have guaranteed him a greater amount of playing time. Dude ... He was traded. I understand that. You know that Tebow's agent could have let Woody/Tanny know that he would not play for the Jets, especially since Sanchez was the franchise's "anointed one". IMO, Just as he did with Orton, Tebow jumped at the opportunity here so he could pull another move to usurp the starter and make a bigger name for himself. What he failed to realize was the power of the nearly-half-century-long SOJ curse. Now, Tebow-Mania is a sputtering joke, for which I am glad. We'll ...I can't blame a guy for looking for a place to become a starter .. I can however, sympathize with your sentiment. Me, too. I respect you and your opinion. I just think the entire Tebow signing was misguided by all sides: Woody, Tebow, Tebow's agent. Some day, Sanchez will finally admit that bringing in Tebow damaged his psyche and ability--as well as had him dealing with the pressure of always looking over his shoulder--to play the QB position this season. I agree ... But bringing in Matt Flynn would have had the same exact effect on Sanchez. No doubt. We have now come to know that Sanchez is easily damaged emotionally. In the old days, we might have referred to Mark as a "Candy A$$". Instead of elevating his playing level, Sanchez sulks and goes into the tank. Mark Sanchez gives us the best chance to lose.